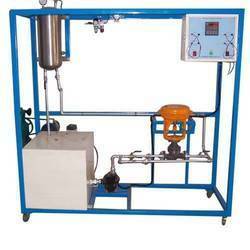 We are a leading Manufacturer of pressure control trainer machine and pressure loop control trainer machine from Pune, India. Owing to a long-term destination for our business, we are engaged in offering a wide gamut of Pressure Control Trainer Machine. The offered control trainer is manufactured using the best quality components and contemporary techniques in varied sizes and other technical specifications for our clients to choose from. Our provided control trainer is tested on predefined parameters. Moreover, clients can avail this control trainer from us at nominal prices. Owing to a long-term destination for our business, we are engaged in offering a wide gamut of Pressure Loop Control Trainer Machine. The offered control trainer is manufactured using the best quality components and contemporary techniques in varied sizes and other technical specifications for our clients to choose from. Our provided control trainer is tested on predefined parameters. Moreover, clients can avail this control trainer from us at nominal prices. Looking for Process Control Trainer ?